While my opportunities to sneak away may diminish with summer, the world of Texas wine isn’t slowing. In fact, it continues to expand in size and reputation. My news feed has been full of announcements of accolades, invitations, and openings. While I can’t attend or respond to all of them in the 18 minutes of free time,(on a good day) I am there in spirit, and in time, I’ll get to experience these wines and places myself. One event I was able to attend was sponsored by Llano Estacado and featured wines from their new line for restaurants, Mont Sec. The Sauvignon Blanc and Grenache Rose are made from grapes from Mont Sec Vineyards in the Chihuahuan Desert. Despite the rugged climate and challenging conditions, the area yields fruit that makes fantastic wine. I really enjoyed both wines and would buy them by the case if I could. Unfortunately, they are only available through restaurants. If you see them, don’t hesitate. I paired the Mont Sec Sauvignon Blanc with Greek style meatballs, Tzatziki. and cucumber salad. I shared the bottle with my family, all of whom were impressed. 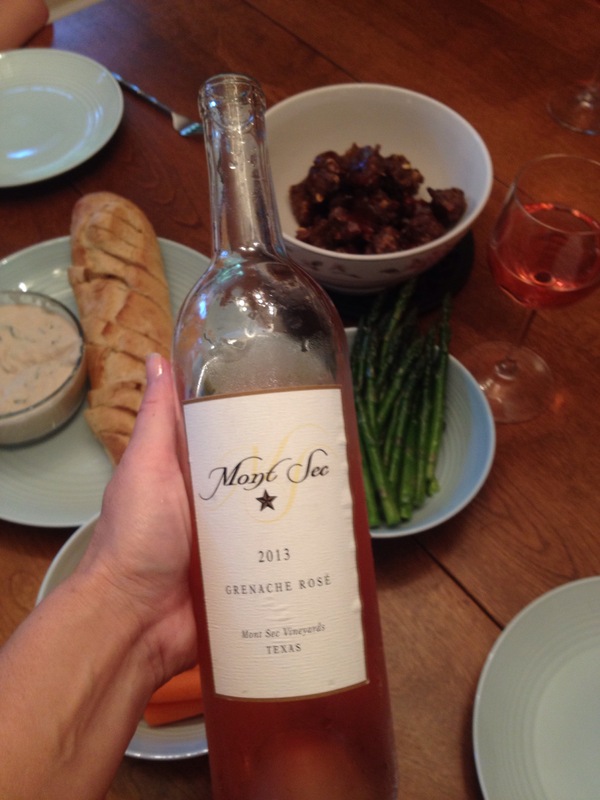 The Rose was a fun fresh compliment to a casual Friday dinner of Berbere meatballs, Rosemary white bean dip, asparagus. My only complaint was that there was a hole in my glass. The other stand-out of the evening was, of course, the flagship Viviano ($35). The nod to a Super Tuscan (70% Cab, 30% Sangiovese) is a perennial favorite. Jubilant fruit, spice, elegance. 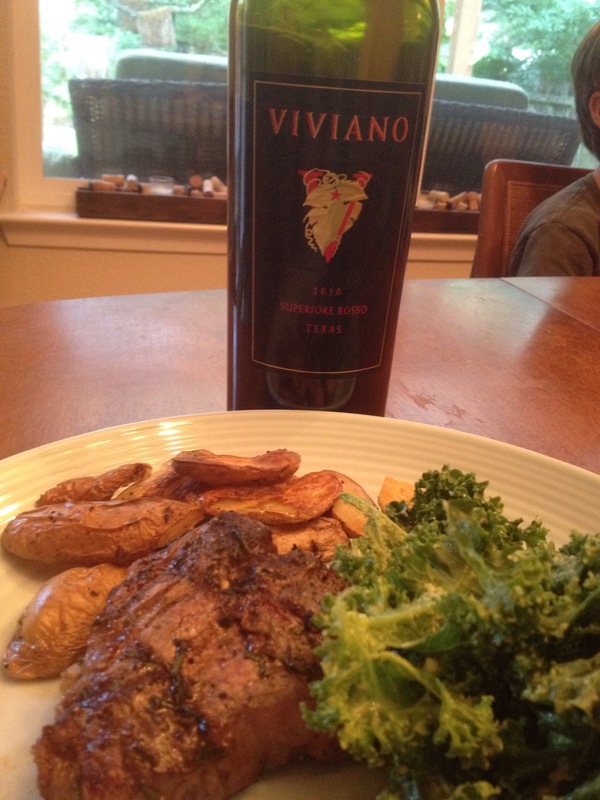 I paired a bottle with lamb chops, roasted fingerlings, and kale avocado salad. It worked, but I think I could have done better. I’ll have to try again. Hawk’s Shadow Winery had their opening this past weekend in Dripping Springs. I wish I could tell you something about the wine, but this is one I missed. Since Saturdays from 12-6 are currently booked, it may have to wait until fall. For more information, see their website. If you are looking for something to do this weekend, Flat Creek will be holding Vinopalooza on premise. Music and wine in a beautiful setting sounds like a great way to celebrate. For tickets and more detailed information, follow this link. In the same competition, Brennan Vineyards became the first Texas winery to bring home TWO Double Golds. The 2014 Mourvedre Dry Rose and the 2013 Tempranillo were both given the highest accolades. I can’t wait to try them! Wedding Oak Winery was awarded “Best Albariño” and given Double Gold for the same wine. They also received two bronze medals for Terre Rouge and Sangiovese. These are the awards I have found via social media but when the full list is released today I am sure we will be adding to the list. 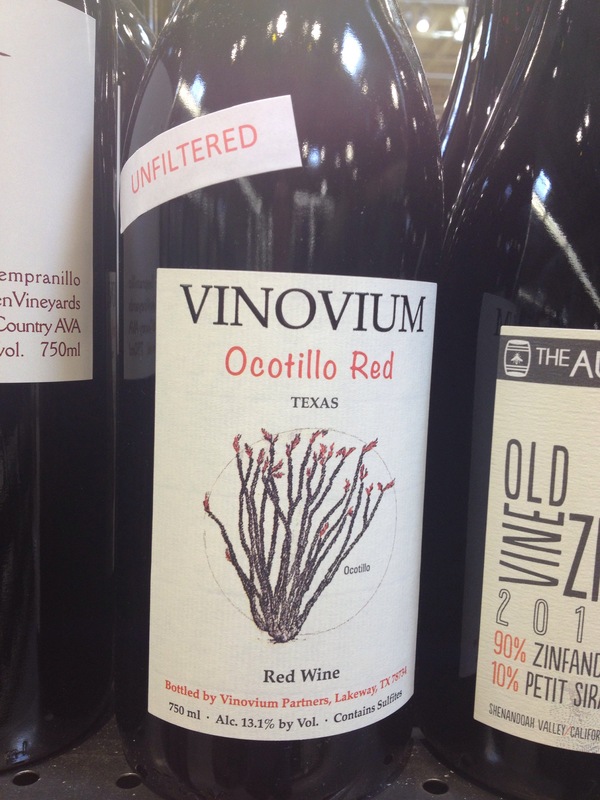 Finally, another wine on the list to try is one bottle by Vinovium Partners that I spied at Whole Foods Arbor Trails. I have the utmost respect for the guys behind this, Daniel Kelada and Craig Mayer. They are driving the Texas Wine Journal and putting their efforts, energies, and enthusiasm into Texas wine like few others. In summer, my children’s freedom expands, mine shrinks. And attempts to shrink waistlines for summer means an expanding list of wines I need to try. My apologies for not much in the way of personal experience, but just because I’m having less fun in the wine world doesn’t mean you can’t have it for me. I’d love to hear about your adventures and new discoveries in #TXwine. I’ll put them on the list for the freedom of fall. Cheers! P.S. The complete list is available now on TX Wine Lover. So much to be excited about! I completely understand. My kids are 19 and 16 and they are running me ragged! Hang in there. Some day we will sip wine together while relaxing on one of the many Austin lakes!